To keep ground-truthing California's quest for a greener grid, I interviewed Dave Olsen, a two-term governor of California's sprawling electric grid, known as the California Independent System Operator (CAISO). See Part IV for the start of our conversation. As we were finishing our coffee, I pressed Olsen on other options for taming the duck curve: "You can also get more flexibility simply by making the grid bigger ... by expanding it -- adding states," he responded. For instance, "you could send some of the morning solar power in California to other states, while wind power from Wyoming produced later in the day could be used to satisfy California's demand. That would reduce everyone's costs." By the CAISO's estimates, consumers could save up to up to $1.5 billion by 2030. Olsen also pointed to the Midwest's regional grid, which serves 15 states. "That grid has made it possible for Iowa to have very high levels of wind power, now over 60 percent at times -- and they expect to have 85 percent -- because they can sell excess wind to other states and, in turn, buy fossil power when the the wind slacks off." As we finished our breakfast, talking loudly over the background jukebox (de rigueur at diners, it seems), I steered our conversation to one of the central issues I had raised in La Jolla. Are renewables really up to the task of delivering those oft-forgotten reliability services? It's not that solar and wind farms can't provide these support services, Olsen responded. "Wind and solar farms both generate direct current (DC energy) and they have inverters to convert and sync the electricity to alternating current (AC) used by the grid." He hesitated a bit, plainly wanting to be careful about how he put it. "There is still some research and development to be done, but we are pretty much satisfied at the ISO that, if we send a signal to the generator, a smart, fast-acting inverter can help to stabilize the grid in the same way that large gas-fired plants do." That's by increasing or reducing resistance, he explained, and by changing how much energy is provided. "It's not really a technical problem anymore but a question of pricing these services right on the grid, or writing them into the contracts that utilities have when they agree to buy power from a large solar or wind generator." As we paid the check, Olsen suggested that I take another run at the question of reliability services when I visited the ISO's Folsom headquarters later in the week. "We've got a good staff and you get into as much detail as you like with them." Before going to Folsom, I stopped in San Francisco to get a second read on the challenges facing the ISO from E3, the go-to corporate consulting group for California's electricity market. In 2013, it was E3, a short-hand for Energy and Environmental Economics, that did the first deep dive on the feasibility of increasing the state's renewable power mandate to 50 percent. The exercise, which helped shape the CEERT's later study, was underwritten by the state's largest utilities. E3 found that, yes, the electric grid could handle the challenge. "There were no technical problems ... no reliability issues. And the rate impact was modest," said Arne Olson, the E3 partner who lead the modeling work. Olson, who has over 20 years experience in the electric sector, told me, "Nobody had ever worked through how you could run that level of renewables ... and we showed you could do it. But we also found that the costs were much higher if you don't have the right kind of renewables, and if California was to go it alone. "There is always a struggle here between those -- and this is in the context of a global commitment to tackle the climate issue -- who want to work with all their neighbors and bring them in, and those who want to preserve the option to be independent -- for California to act by itself." Olson himself is plainly in the first camp. "It doesn't make sense for California to act like an island. If we have a regional grid, that's about the same as a 10 percent boost in the level of renewables, for about the same cost. That's important," he told me. A multi-state grid "also gets you beyond the 50 percent level, to 60 percent or more renewables. It is very hard to do that without it." E3's modeling work also suggests the state may have to accept some residual use of natural gas-fired generation. "We haven't run a single 2050 scenario where you don't have some level of gas-fired power, whether it's 10 percent or 15 percent. We will need that to fill in the gaps for contingencies and to handle some of the peaks," Olson said. To keep that percentage low, Olson said, renewables must become more versatile. "We can dispatch, sell renewables today every hour or 15 minutes. But what about the instantaneous response when a large generator exits the system? Or what do we do when there is too much energy, with solar when it is being spilled already. Generators must be able to back off quickly, to provide the 'down regulation' needed to balance the grid." Despite these caveats, Olson was optimistic. "With 50 percent renewables, you can meet the greenhouse gas reduction target: 40 percent below 1990 levels for electricity. It doesn't do that for the whole economy, but it's still significant." Thirty minutes from San Francisco, on the 110-mile drive east along Interstate 80 to Folsom, the highway worked its way through grassy rolling hills dotted by live oak trees with large spreading canopies. Cattle grazed under the slanting November sun. My mind wandered. On the horizon, however, a long line of gigantic power pylons bisected the landscape and my thoughts turned back to the destination. The control room for California's ISO is nestled in a nondescript suburb, hiding in plain sight. Although the ISO has become the functional nerve center of the state's economy (in our plug-dependent, internet-infused world, almost everything soon seizes up without electricity) there is no signage. Once past the security gate, the long glass-fronted building, divided by a central atrium, looks much like a typical Silicon Valley corporate campus. It is fronted by rows of solar PV carports and EV charging stations, but nary a power line in sight. Before climate goals began to repoint the ISO's priorities, it was designed to carry out two main jobs. Most visibly, it was tasked with overseeing the electricity sector's core infrastructure, such as the strings of long distance transmission lines along Interstate 80 -- and the switching yards full of transformers that step high voltage down for the local grid. Much less apparent, but equally important, is the ISO's management of a round-the-clock energy market. It matches supply -- the energy available from over 750 large grid-connected power plants (and, indirectly, several hundred thousand distributed roof-top solar and other generators) -- with the collective demands of over 30 million users. This market is worth $11 billion annually and unless it functions seamlessly, setting a round-the-clock price for energy (for the ISO, this means every five minutes, every hour and for the day ahead), the grid can freeze up. Generators may not supply enough power to meet every user's current needs. If the shortage is severe, there may be rolling brownouts and blackouts. My hosts at the ISO were Phil Pettingill, who is directing the ISO's regional expansion, and Clyde Loutan, a senior technical adviser for integrating renewables. We started out in a second-floor conference room which overlooks the ISO's large, internal control room. The back wall of the control room was almost completely filled by a giant, 80-foot-long mosaic of floor-to-ceiling video screens. It seemed a distraction at first, a PR device to mask what the current shift of grid techs was doing at their workstations before it. But as my eyes adjusted, and Pettingill began to walk me through the mosaic, I began to realize that the displays provided a good way in to several questions I had raised in La Jolla and Ventura. Much of the left portion of the video montage was taken up by a schematic of the ISO's primary transmission links and transformers; bar graphs below highlighted the voltage levels at key connection points. As we watched, red lights came on across the screen, and then blinked off, as voltage dipped and then was normalized. To keep the voltage stable, the ISO calls on generators to provide volt-ampere reactive power (VArs). That is done by injecting or absorbing bursts of power, much like a jogger uses her legs to keep a steady pace on a treadmill that is constantly changing speed. Traditionally, gas-fired and other large power plants have used the kinetic force derived from their huge spinning generators to provide these reactive services. To avoid burning fuel and causing unwanted emissions, Loutan said the same kinetic force also can be delivered even if a generator's rotor spins free, by decoupling the rotor from the large coils of wire that are ordinarily spun through magnets to create electricity. That means it "can work as a synchronous condenser" (a voltage control device) and be paid just for that service. CEERT and other environmental groups want all gas plants to be able to operate in this fashion. During my tour, Loutan confirmed that the ISO also could get these reactive services from renewable generators if it had advanced DC to AC inverters. A renewable generator must also be willing to operate below full capacity, forgoing some energy sales ("they need headroom to inject power"). "This system can deliver very quickly, in milliseconds, faster than a typical fossil plant!" So that's what it takes, I thought, to truly impress one of the state's senior grid geeks: solar megaVArs. We moved on to the central portion of the video mosaic, which displayed frequency data. Inset on adjacent screens, captioned "BAAL," was an image that looked like a living room-sized display for Atari's classic 1970s video Pong game; a large white "ball" floated back and forth between two inverted boomerang-shaped "paddles." Pettingill explained that the "game" was to keep the white orb from moving past either "paddle" which bracketed the acceptable frequency tolerance on the grid. It was defined by BAAL, an arcane acronym that referred to a real-time measure of the grid's frequency which must not exceed pre-defined limits for more than 30 minutes. 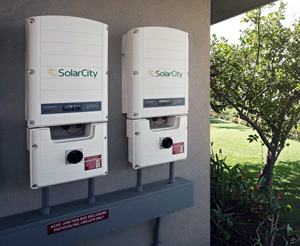 Otherwise, electric service may be degraded and connecting grids (in adjacent states) also may be affected. The grid's standard frequency (60 Hz) tends to fall when total generation declines and rises as it increases. (Technically, I was told, frequency decays in proportion to the grid's aggregate "inertia," which reflects the total rotating mass of generators on the grid.) These often-minute changes are corrected in real time (lest they snowball) by instantaneously connecting or disconnecting frequency–synched reserve generators. Hence the "BAAL pong" display was much more than a game. 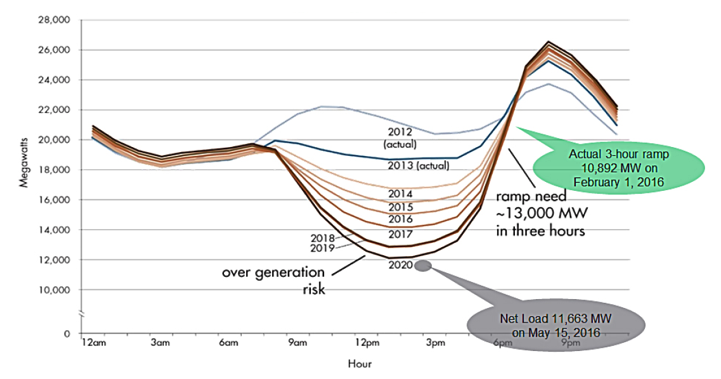 In the past, idling fossil fuel or hydro generators (sometimes known as "spinning reserves") provided a good part of the needed frequency response services. Today, however, new energy storage facilities (batteries, flywheels) and renewable generators can offer like services. But to date, the market has frustrated diversification; the ISO's prices for reliability services are depressed. Frequency support, for instance, may fetch only 10 percent per hour of the price paid for raw electricity. This is due, in part, to a surfeit of offers from legacy generators which has frustrated new providers, including new battery-based and other storage providers. As we watched the ISO's big screens, Pettingill pointed out that frequency standards for wholesale markets are strictly enforced by the North American Reliability Corporation (NERC), a non-profit entity reporting to federal regulators. Fines for non-compliance are high. "Missing a NERC standard can run into millions of dollars," said Pettingill. That keeps the ISO's geeks focused on the data feeds in front of them, even though a technical violation might go entirely unnoticed by the public. "What my boss asks me is this," Loutan said, "'Did you drop load?' Or, 'Did we need to declare a "staged emergency"?'" That kind of declaration might trigger TV news bulletins across the state calling for voluntarily power cuts by consumers. "We haven't had that, though, despite record levels of renewables," Pettingill interjected. "Service has been reliable." The managers of wholesale electricity grids, such as the CAISO, are also overseen by the Federal Energy Regulatory Commission (FERC). It functions much like a market referee. Under President Barack Obama, the FERC generally has ensured that ISOs establish fair interconnection terms for new renewable energy providers and do not underprice electricity conservation or negawatts -- a key plank in California' climate plan. Notably, in 2013, FERC ruled that ISOs must pay someone offering not to use one megawatt of energy (for example, offering a negawatt by quickly reducing demand), the same amount as someone offering to generate one megawatt of energy. These FERC initiatives have underpinned the ISO's own efforts to make the grid more flexible, fending off challenges from legacy energy sellers who see their market share shrinking. In fact, the CAISO often has prodded FERC to be more proactive. For instance, the FERC recently ordered all ISOs to direct new solar and wind generators to add advanced inverters (or like means) to provide reactive power. The ISO petitioned it to include older facilities as well as automated voltage control systems. CAISO also wants to see FERC quickly resolve the ground rules for services offered by electric storage, as fully pricing the benefits of storage would help this sector play a larger role in California and on other regional grids. However, given the leadership changes anticipated at FERC, the ISO is concerned that pending agency proposals on storage (and related measures to expand the sale of electricity conservation) may be changed or deferred.